Police Raid Home Of New Jersey Couple Who Raised $400,000 For Homeless Man The seemingly heartwarming story has taken an unpleasant turn, with the man suing his would-be benefactors, saying they stole most of the money raised in a GoFundMe campaign. 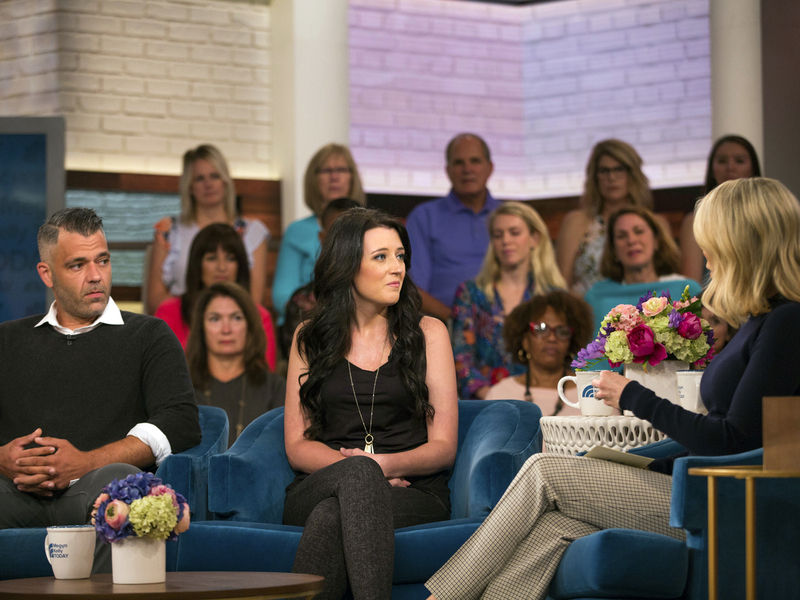 Mark D'Amico and Kate McClure speak with host Megyn Kelly on Megyn Kelly Today, last month in New York. Police in New Jersey raided the home of a couple who raised $400,000 in online donations for a homeless man but are now accused of pocketing most of the proceeds. The Burlington County Prosecutor's Office and the Florence Township Police Department executed a search warrant on the Florence, N.J., home of Kate McClure and Mark D'Amico, hauling away boxes and bags of evidence as well as a new BMW, according to local media. The story has attracted national and even international attention. It began last October when McClure ran out of gas on a stretch of Interstate 95 in Philadelphia. A homeless man, John Bobbitt, approached her and offered to help. He walked to a gas station and spending his last $20 to buy gas so McClure could get home to New Jersey. As NPR's Vanessa Romo wrote earlier this week, "In gratitude, McClure and Mark D'Amico launched a GoFundMe campaign that went viral and received more than 14,000 donations totaling $402,706. In McClure's pitch to the public, she pledged to use the money to buy Bobbitt a home and his dream car — a 1999 Ford Ranger." The seemingly heartwarming story led to high-profile television appearances for Bobbitt, McClure and D'Amico and even an interview on BBC. However, Chris Fallon, an attorney for Bobbitt, says that instead of a house, McClure and D'Amico bought his client a trailer, registered under McClure's name, and parked it on her family's land. Fallon says that since then, the online donations have vanished. Bobbitt — reportedly a military veteran struggling with substance abuse problems — filed suit against the couple, claiming they used the money from the GoFundMe campaign as a "personal piggy bank" to "fund a lifestyle they could not otherwise afford," according to The Associated Press. The AP writes, "In court Wednesday, the couple's lawyer said Bobbitt has gotten about $200,000. But Bobbitt's lawyer said he had received only about $75,000, which includes the value of a camper and a 1999 Ford Ranger." On Thursday, a judge presiding over the Bobbitt's suit ordered McClure and D'Amico to give written depositions by next week accounting for the money that they raised on Bobbitt's behalf. The judge also ordered the couple to appear in court next week. WPVI, the ABC television affiliate in Philadelphia, reports that an attorney for McClure and D'Amico tried to assert a Fifth Amendment right against self-incrimination for his clients.